We originally ran this article in 2017, but it continues to be a hot topic that we get asked about all the time, so we decided to listen to readers’ requests and run it again with a few updates. Please enjoy! Harvard Business School has declared that a Roth IRA is the clear winner over a traditional IRA. For some time now, I have also believed that Roth IRAs are better, but for a completely different reason. First, let’s look at how these two powerful retirement tools work. 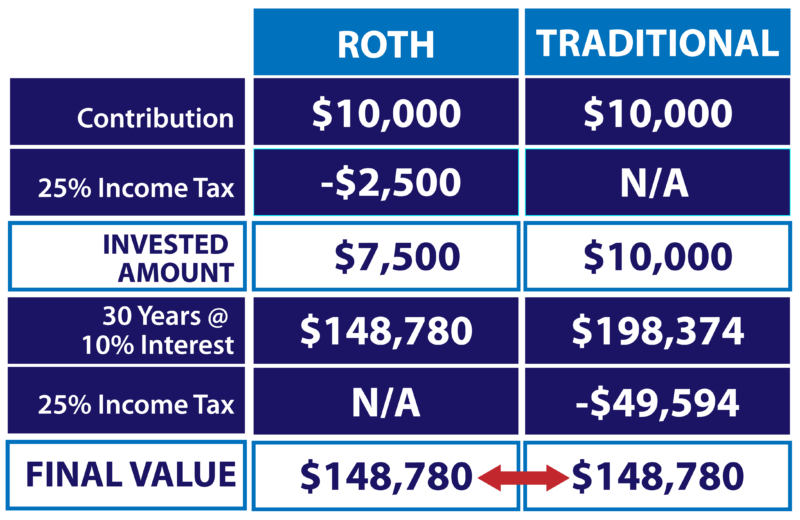 Traditional and Roth IRAs are structured pretty much the same, with the only real difference being when your money gets taxed. With a Roth IRA, your money is taxed when you make your contribution, allowing you to withdraw your money tax free in retirement. With a traditional IRA, taxes are deferred until you withdraw your money. So, looking strictly at the numbers, which is better? 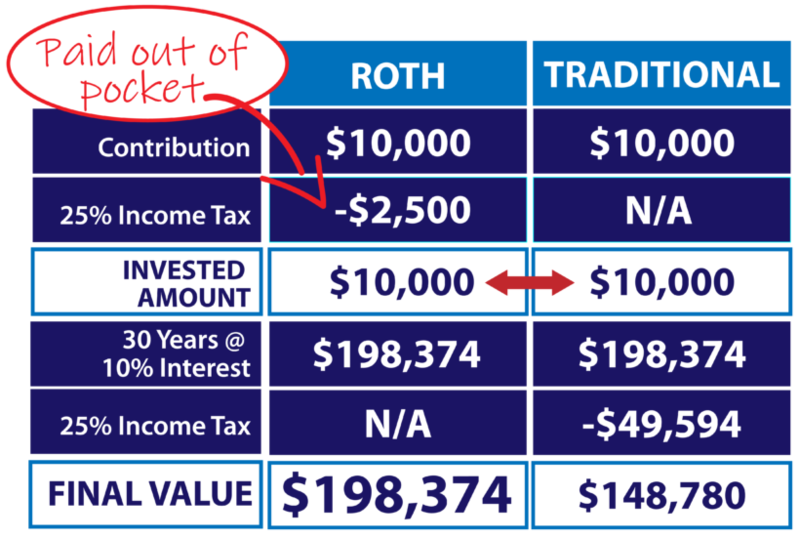 In this example, we’ve compared a $10,000 one-time contribution in a Roth vs. a traditional IRA, with both invested at 10% interest for 30 years, in a 25% income tax bracket at the time of contribution (for the Roth) and at the time of withdrawal (for the traditional). As you can see, mathematically, they are identical, with each account worth $148,780. It seems simple enough, yet I would argue that this is not realistically how it works. Many people who opt for the Roth IRA invest the full $10,000, paying the $2,500 in taxes out of pocket instead of taking the taxes out of the contribution. This means that the full $10,000 (instead of $7,500) would grow tax free —this single action would increase the Roth’s final cumulative total to $198,374, making a Roth IRA the clear winner with 33% more accumulated wealth. And remember, this example assumes a one-time investment. If you were to multiply the investment by 30 or 40 years’ worth of contributions, the difference would be enormous. “Harvard and I agree that a Roth account is the way to go. Both groups – those who invested in Roth 401(k)s and those who invested in traditional pre-tax 401(k)s — consistently used the same rules of thumb. Since the same amount would be going into both the Roth and the traditional 401(k), but since the Roth is tax free at the end, individuals who kept their rules of thumb in a Roth saved even more and had greater purchasing power in retirement than traditional 401(k) savers. These are the numbers and facts as to why a Roth IRA is the clear winner. But most of you know this already, so what makes this article any different? I believe there is an even greater, much simpler reason to go with a Roth that is often overlooked. After understanding how the two IRAs compare number-wise, the only thing left that edges one out over the other is the peace of mind the Roth can give you. You can sleep better at night knowing that, in the end, you’ll be able to withdraw your money tax free. Plus, since we are human beings, not calculators, our emotional well-being trumps cold, hard data. None of us invests without being emotionally involved. Even though I am a self-proclaimed “spreadsheet king,” I will only move forward with an investment if I feel good about it.